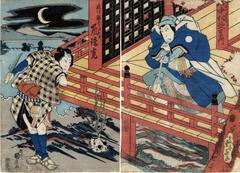 Please note the awesomely gruesome human skull lying on the ground below the edge of the engawa on the left panel. Rising up from it is a ghostly (gray colored) flame, the symbol used ordinarily to mark things-supernatural in Japanese woodblock prints. Ikeda Bunko, Kamigata yakusha-e shūsei (Collected Kamigata Actor Prints), vol. 2, Osaka, 1998, no 131.